Dewey’s unsuccessful runs for the White House in 1944 (against FDR) and 1948 (against Truman) overshadow his early success as a New York prosecutor. 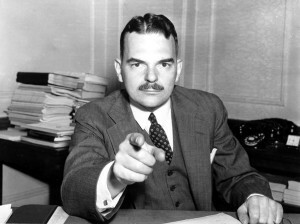 Between 1935 and 1937, his prosecution of organized crime in New York resulted in 72 convictions out of 73 prosecutions. In 1942, he was elected to the first of three terms as New York governor and was a powerful Republican political leader.